THE KENYA SAFARI ACROBATS® have redefined the perception of African Acrobats. For the past 20 years they have wowed and awed audiences all of the USA. in the past 8 years the group has gone through some major POSITIVE changes. Why change what is has already made them? They wanted to bring fresh acts, and change how the shows would go. If you have seen an African Acrobatic Show you know they can very predictable from the actual acts to the number of artist on the stage. The KENYA SAFARI ACROBATS have changed the way they bring a show to your venue. Bringing high energy with lots of daring maneuvers. Even going as high as 8 chairs, that are over 25 feet in the air without a safety harness!! They are experts in the Rolla Bola, Chair stacking, somersaulting, precision tumbling, and gymnastics. They defy gravity with hoop diving, juggling and amazing contortion acts..Including an awesome Rag Doll Act that was premiered in 2017. Audiences watch as they push themselves to the limit. This includes one of the female artist bending metal with her teeth. And another spinning on his head for 1 minute. At times the group is accompanied with drummers and even live bands at some of their themed shows. The acrobats are celebrating 20 years of touring by bringing a show called fusion! a celebration of African and Caribbean dance and music. 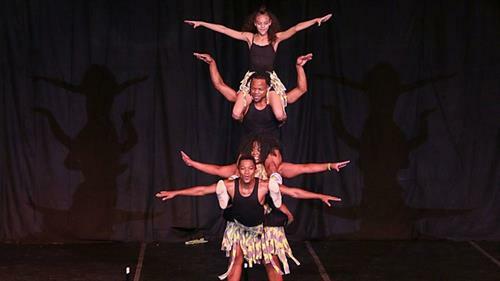 In December 2016, THE KENYA SAFARI ACROBATS premiered in JAPAN where they astounded the military and their families for a holiday special with their incredible talents. Co-Sponsored by First Interstate Bank and the Des & Carrie Bennion Family/the Bon Agency Insurance, and TownSquare Media. Partial funding is from the Schneider and Cate Funds in the Wyoming Community Foundation-Casper, and Natrona School District No. 1.